Blue color is quite common for bathroom design. But how to make it more unusual and stylish? There are many shades and hues that can be used for creating a stylish bathroom design beside the light blue. Dark blue color scheme for the bathroom is a stylish alternative to quite usual pale blue. Rich hues also look great as accents in furniture and tile work. If the dark shades are too overwhelming for the small bathroom opt for dusted, mutted blue hues. Dark blue bathroom can be enhanced with a couple of bright accents in purple, yellow, and green. Azure blue bathroom makes for a real getaway atmosphere. 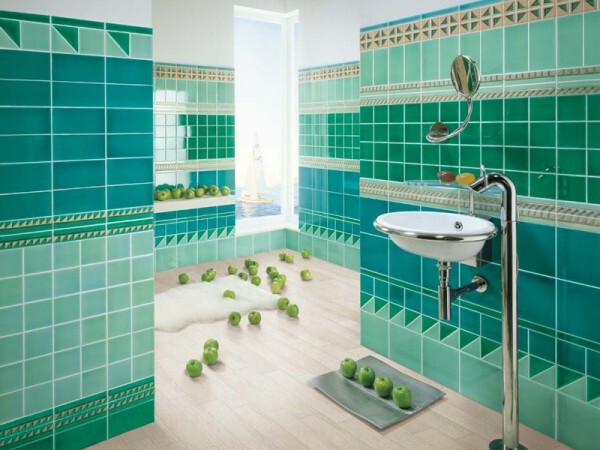 Beautiful azure blue goes great with bright sunny yellow and it’s a great color for creating a coastal bathroom decor. Beach-y theme can be emphasized with accessories and decorations like seashells, stripes, and other coastal theme attributes. Blue can be used as a main color and background for the bathroom decor. Adding multicolored accents can help create interesting and unique bathroom. Combine different shades of blues, greens, and purples together for the ultimate watery color scheme.